A pretty cool movie with a great premise. This is a fun 80s movie that combines videogames and conspiracy theories in exactly the right way. Unlike other gamer movies from this time period, like Tron, which found no connection to believability or reality, Wargames taps into the Cold War paranoia against Russia, and does it by way of nuclear uncertainty and war. The movie is about a teenager who accidentally hacks into the system which tells American defenses that Russia has tons of nuclear weapons aimed at them. Then it says that Russia has launched them. And now it’s up to the American government to retaliate. If this sounds a lot like Crimson Tide, that’s because the premises are definitely along the same lines. Here, instead of a submarine, it’s a videogame, and the movie really goes for it with this concept. It creates multiple threats, and features high-up ranking government officials who monitor world events while sitting in a war room. This movie is an entertaining ride. 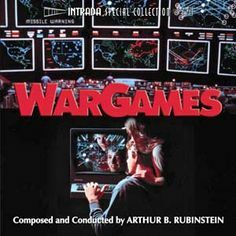 Wargames is the 80s version of Fail Safe meets Dr. Strangelove. It’s the movie about a nuclear crisis gone wild, all at the hands of a teenager who hacked into the wrong system. The storyline here is completely creative and original in terms of where it takes its ideas. Sure, other movies might have influenced it, but this film takes those elements to the next level, perfect for the time period. And while those other movies dealt with the political situations and decisions behind nuclear war, this one deals with videogames and hacking and where all of that can end up leading. The movie is a classic for all sorts of reasons, including the way it captures the 80s paranoia of America, about the Soviet Union and melds that together with the videogame playing youth. It’s not the casting, however, that made this movie so special. It’s the plot. A movie made today about a teenager who got tangled up in a government conspiracy of sorts would feel silly, and more like a made-for-TV story than anything else (Mr Robot, anyone?) And yet, back in the 80s, it worked. Perfectly. But the real miracle or unexplainably awesome situatuon is that the movie somehow still holds up today ina way that other 80s videogame films, such as Tron, do not. Perhaps it’s because of how real the fear seems and how this movie doesn’t spend its time in the videogame world, but instead brings the videogame into our world. In terms of the political situation and history, this movie was made at a time when we had no idea what Russia was going to do or what they were capable of. And the film asks the question of what would happen if our defenses were all automated, and no longer human controlled, and then if something went horribly wrong. What if the computer got the wrong message and there was nothing we could do about it? Consider that a full decade later, the movie Crimson Tide was based around a similar situation, only it substituted a submarine for the computer. The movie opens to scenes of some government tests. Men are put in chairs with the nuclear launch codes right in their fingertips. They are instructed that when the command comes in, to launch the missiles, they are to do exactly what it says, without hesitation. That means they are to turn their keys at the exact same moment and let the missiles loose. Only some of these men have reservations when put into the actual situation. Humans have an element of doubt that they need to confront and get past. Computers do not. After trying out the test and seeing more than one of these launch operators refuse to turn the key, the decision is made to get rid of the human element and replace it with a computer. We even get to see the chairs being taken out of the room, representing the idea that human involvement is being eliminated. This is a great beginning. It makes it seem like the conflict will be that the machine wants to launch the missiles, and since there is not human there to stop it, there’s really nothing we can do. Only this is not the case. At least not for a while. The movie sets us up to think this is the way the storyline is headed and then it gives us something very different. It gives us the story of a kid who hacks into the machine and causes a situaiton where it looks like Russia is about to launch missiles at the U.S. Then it is the people of the US who do still have some control, that decide we need to launch our missiles at them first. All of this starts with a highschool student named David, hacking into different systems. The first one he hacks into is the school grading program. He and his friend, Jennifer (Sheedy,) are hanging out one day, around his house, and she asks him why he isn’t concerned about his grades. That’s when he shows her. David changes all of his grades in the system, and then does the same thing for her. When she demands that she change it back, he does. Only the moment she leaves, he changes her grades again, giving her all As. David continues to hack into different systems, and the next thing you know, he thinks he has hacked into a game system and can play things like computer chess for free, only the truth is he has found access to so much more. One of the games on the list that comes up on David’s monitor is called Global Nuclear War. David decides to play and thinks he is just messing around, imaging a situation where he can blow up certain countries on his computer. Only he sees on the news that night that the U.S. government believes all of the countries he is launching missles from are actually launching them at the United States. Suddenly David is public enemy number one. He is brought into the War Room and top secret headquarters area, where the men in charge of the facility put David in restaints and have him sit in a room by himself. They don’t know what David did, but they sure know it isn’t good. They start to think that maybe David is a spy for the enemy. That’s when David makes his escape and goes on the run around the facility. It becomes his job to convince everyone there that this nuclear strike is not actually happening, and is all just part of a game. In order to do that, David and Jennifer have to go and find the original creator of the game, off in his secluded island world. At that point, the movie take a slight tangent off the road, getting away from the war room, in favor of a sort of cop out approach. That’s okay though, because there are more surprises coming. One involves that situaiton at the beginning where the human element was taken out of the situation. Let’s just say we do get a payoff, in the final act. This movie is intriguing and fun. There aren’t many complaints to be had about it, but one of the few ones is that I wish Dabney Coleman had been given more of a character. He is pretty much against David, the entire time, and that’s about it. Still, the movie is interesting, unusual, and a lot of fun.